One of my favorite memories was our first visit. We arrived on an early morning flight and ended up downtown with a few hours to kill before an 11:00 am meeting. We quickly found coffee and went for a walk. We ended up on the drawbridge, watching the sailboats pass through (yes, we are from Missouri. This is FASCINATING!) When we walked across to the other side, there were little kids getting into tiny sailboats (dinghies) for lessons. There were several instructors (in a separate boats!) with approximately 5 dinghies per instructor with 2 kids in each dinghy (approximately 5 years old?) We were awestruck and we returned the next morning with more coffee and watched it all over again. Another favorite memory was the evening we stumbled into a restaurant on Wednesday night and snagged a table on the patio above the city marina. To our surprise, it was race night and we watched them lift at least 25 the boats out of the water with military-like precision, lower each one onto a trailer and push them back. Yes, we're newbies. We're still awestruck by the travel lifts! After at least five visits, some less than 24 hours, we are started to get the hang of the town. We've been declared as "residents in training." Every conversation begins with "Where did you eat last night?" and ends with "where are you going to eat?" My kinda town. (We are still being chastised for not remembering the name of the restaurant across from Burt Jabins marina, inside the gate community, overlooking the marina where we had one of our most memorable lunches. Boat shopping would have ceased for the day if Husband hadn't stopped me from ordering the second coffee-with-pumpkin-Kahlua. "I want another one! No you go ahead. I'll wait here. It's cold outside!"). Our second favorite restaurant is Cantlers on Mill Creek (I had to look that up on a map because, apparently the "crab restaurant on the next creek over" doesn't narrow it down). To make it more interesting, directions are given with reference to restaurants, bars and liquor stores. "Across from Boatyard Bar & Grill." "Between Carrols' Creek Cafe & the Charthouse." "The boat we're going to see is over near Cantler's Crabhouse." One broker trip took us to at least 4 different marinas in one day (and yes, the natives get lost also! But don't tell. I think that's a secret). By the end of the day, I was getting the hang of it. If you are at an intersection where there is a liquor store (or "mart" with ice) then you were very close to a marina. Always make a right--I'm not sure why (all lefts on the way back to the liquor store). "Is there a liquor store because there is a marina or is there a marina because there's a liquor store?" Does it matter? Apparently not. Marinas. So many marinas! On our 4th(?!) trip, we walked into a marina and I said, "We've been here before!" 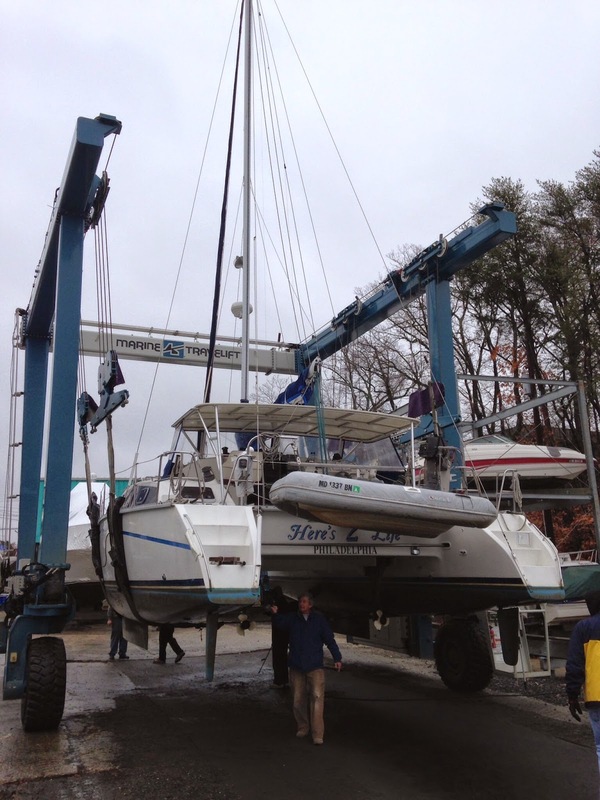 It was next door to the very first boat we ever looked at--a Beneteau First at Burt Jabins. Wow. How far we've come! Amelia the cat, is going to live on a cat! Do you know how to sail?